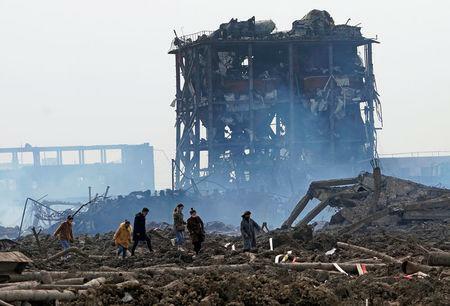 YANCHENG, China (Reuters) - Rescuers in eastern China pulled a survivor from rubble early on Saturday, two days after a massive explosion at a pesticide plant killed at least 64 people, flattening nearby buildings and shattering windows more than a mile away. After Thursday's blast in Yancheng, police, some wearing face masks, sealed off roads to what was left of the devastated, smoldering plant. Windows were smashed in the village of Wangshang two kilometers (1.2 miles) away, where stunned residents likened it to an earthquake. Some volatile organic chemical measurements far exceeded surface water standards, by 15 times in one case, the Jiangsu bureau said.